Consumer goods giant Unilever has partnered with Kantar Media, Nielsen, Facebook, Google and Twitter to build a standardised cross-media brand measurement model. The model will combine existing industry measurement tools into a solution to measure ad investments across TV, digital and social media, while helping brands measure and understand campaign impact across the media landscape. Through the tool, the partners will aim to measure a campaign's audience, the audience reaction, and the impact and effects of a marketing initiative over its lifetime, to gauge the cumulative impact media has on consumer behaviour. In addition, Unilever is talking to the World Federation of Advertisers and other industry bodies to invite other brands, platforms and publishers to join its efforts to further develop the measurement system. 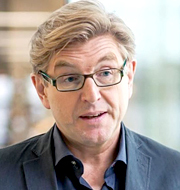 Keith Weed (pictured), Unilever CMO, says his firm is 'hugely encouraged' that its digital and measurement partners worked with Unilever to help solve the challenge of holistic media measurement, indicating 'a genuine willingness across the industry to find creative, effective solutions to shared issues'. Nielsen's President of Media, Megan Clarken, added: 'Regardless of where you stand in the industry, having cross-platform measurement is essential to driving monetisation and growth. We're proud to support Unilever's efforts to drive standardisation and adoption of cross-media measurement'.